$subject could be a common error for many new ESB users - so, thought of keeping a note here. To recover from this error - you need to edit the file [ESB_HOME]/repository/conf/synapse-config/proxy-services/your_service_name.xml and add the following parameter..
Now restart the ESB and you will notice that this particular proxy service is not loaded - but the ESB starts fine. 1. First you need to enable SSL at both the server and the client as per my previous blog post. 2. There you would have noticed that - even though we enabled SSL at the server end - still the JDBC clients can connect with out using SSL. 3. To enforce SSL for the JDBC connection from the client end - we need to have REQUIRE SSL - in the GRANT statement for the MySQL user associated with the JDBC client. 4. Now regadmin user won't be able to connect to the regdb database without a JDBC connection over SSL. Recently we did the $subject in a production deployment and thought of keeping a small note here. I blogged about the $subject sometime back here - but that is no more applicable to Carbon 3.0.x products. To deploy WSO2 Carbon Server over Novell eDirectory - you can follow the exact guidelines provided in this blog post - following is the only exception. Note : 'P' is in upper-case there. In my previous blog post I explain how to connect WSO2 Carbon Server to a MySQL database. Please make sure it works fine before going through this. In this blog post I will only explain changes required to enable SSL. SSL in MySQL Connector/J encrypts all data (other than the initial handshake) between the JDBC driver and the server. The performance penalty for enabling SSL is an increase in query processing time between 35% and 50%, depending on the size of the query, and the amount of data it returns. 1. Verify whether your MySQL distribution supports SSL. Use following command and make sure it doesn't result with an Error. 101226 13:50:26 mysqld_safe Logging to '/usr/local/mysql-5.1.51-osx10.6-x86_64/data/prabath-siriwardenas-MacBook-Pro.local.err'. 2. Then login to the mysql and run the following query. 3. If all works fine - then your MySQL distribution is enabled for SSL. 5. Stop the running mysql server and start it as below. 101226 18:16:42 mysqld_safe Logging to '/usr/local/mysql-5.1.51-osx10.6-x86_64/data/prabath-siriwardenas-MacBook-Pro.local.err'. 6. Once again login to the mysql and run the following query. 7. That's it we all need from the MySQL Server end. 8. Now you need to import the public certificate and the CA certificate of MySQL server to [CARBON_HOME]\resources\security\client-truststore.jks. But in this case since we use verifyServerCertificate=false in the JDBC connection url of the WSO2 Carbon Server - we can skip this step. 9. Now in both the user-mgt.xml and registry.xml we need to edit the ConnectionUrl and add useSSL=true, verifyServerCertificate=false and requireSSL=true. Please refer my previous blog post to see how to deploy WSO2 Carbon Server over a LDAP User Store. I will highlight only the changes from there - when it comes to a secured LDAP connection. 1. Change the ConnectionURL and set ldaps instead of ldap and set the port correctly. 2. Import the LDAP server's SSL certificate in DER format to [CARBON_HOME]\resources\security\client-truststore.jks. If the certificate is not in DER format you can use OpenSSL to convert it to DER. 3. When starting the Carbon Server - start as following. There replace [CARBON_HOME] with your absolute path to CARBON_HOME. Open up the [CARBON_HOME]\repository\conf\user-mgt.xml and replace it's content with the following. ConnectionName : Full qualified name of a user to access the LDAP server. ConnectionPassword: Password of the ConnectionName. If you allow anonymous access keep this blank. UserNameListFilter: This is to narrow down the search. Set the objectClass properly. UserNameAttribute : This should be attribute where the system will take as the user name for login. ReadLDAPGroups : If true will read groups from the LDAP server. GroupSearchBase : Where the system should find the groups. GroupSearchFilter : This is to narrow down the search. Set the objectClass properly. GroupNameAttribute: This should be attribute where the system will take as the group name. 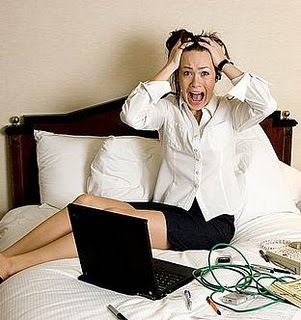 AdminUser/UserName: This user will be treated as the initial admin of the system. Should be belonging to the UserSearchBase in LDAP. Keep the password of this user blank. My previous blog post explains setting up MySQL Server and related tools under Mac OS X. Once you are done with setting up MySQL - login as a root and execute the following SQL. You can use MySQL Workbench for this. GRANT ALL ON regdb. * TO regadmin@localhost IDENTIFIED BY "regadmin"
Once that is done. Open up the [IDENTITY_SERVER_HOME]\repository\conf\registry.xml and add the following section under <wso2registry>. Now, find <currentDBConfig> in registry.xml and set it to mysql-db. That's it for the registry. Now, we need to set User Manager database pointing to the MySQl DB. Open up the [IDENTITY_SERVER_HOME]\repository\conf\user-mgt.xml and edit following settings. Then you need to copy the MySQL DBC driver from http://dev.mysql.com/downloads/connector/j/5.1.html and Place it in the $IDENTITY_SERVER_HOME/repository/components/lib directory. 1. Download MySQL for MAC OS X from here and install it. mysqld_safe is the recommended way to start a mysqld server on Unix and NetWare. mysqld_safe adds some safety features such as restarting the server when an error occurs and logging runtime information to an error log file. 3.Now you can download MySQL GUI tools for Mac OS X from here. 4. Once MySQL GUI tools installed - you can click on MySQL Administrator and login as root with blank password - then go to Accounts and change the root password. 5. 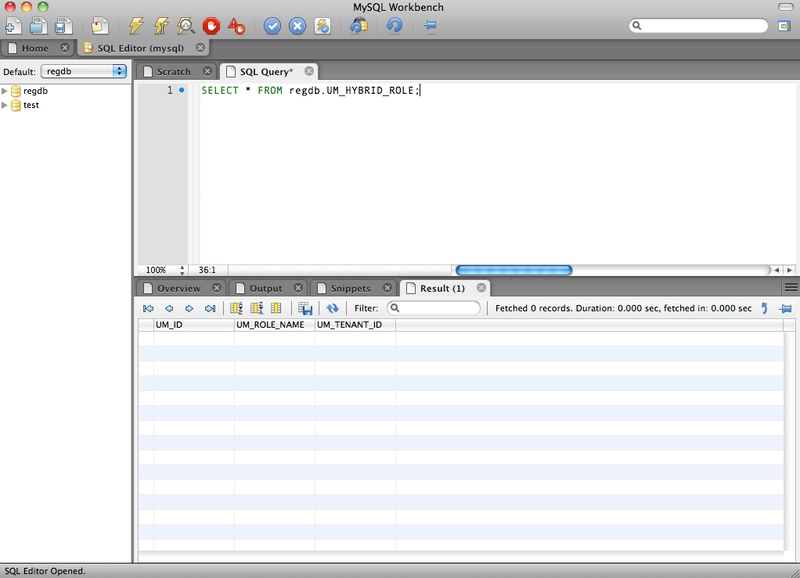 You can download MySQL Workbench for Mac OS X from here. I've been used to the TortoiseSVN client for years now and it gave me everything I needed in a nice UI. Recently I moved to Mac OS X and now getting used to the SVN command line client. I by mistake today did an svn add from the root folder - which added all .java as well as .class files. I could do an svn revert easily, but that will revert the changes I did for existing files as well - which I do not want to happen. So - following is the one I came up with and works really handy - and thought of sharing. We at WSO2 most of the time release many products at once. With the binary distribution + source distribution + docs - amounts to a large number distributions. And signing and generating MD5 and SHA1 for all those is a painful task. Here, prabath is the alias of the GPG public key. The following script will generate ASC,MD5 and SHA1 of all the distributions and will also dump the public key to KEYS file. You should have installed GPG and configured it before running the script. 1. Set up WCF service secured with Kerberos - explained in this blog post. 2. Set up the WSO2 ESB to work with Kerberos - explained in this blog post - follow the steps 0,1,2,3 and 4. 3. Create a resource in the WSO2 ESB - embedded registry with the following content - this is the security policy we will be applying to the out going messages from the ESB to the WCF service. In this example, I created a Resource Collection called 'policies' under /_system/governance and created a Resource called krbpolicy with the following content under /_system/governance/policies. In the policy we have to set the absolute path to the krb.conf - at the same time we need to set the username and password of the client who invokes the WCF service appropriately - and this account should be in the Active Directory. 4. Now create a proxy service - and in the InSequence - in the Endpoint pointing to the WCF service, enable security and pick the security policy we set before, from the registry. 5. Also in the InSequence we need to add a Property mediator and set the following. 6. Now in the OutSequence - we need to remove the Security Header coming from the WCF service before the Send mediator in the OutSequence - you can do it with a Header mediator. 7. Also in the OutSequence we need to add a Property mediator and set the following. These two properties [5 & 7] are needed if the back end service is WCF and it is secured using WS-Security and ESB is acting as a passthrough. When communicating with WCF, wsa:to should point to WCF service endpoint (In axis2, it can can point to some other place, still axis2 will dispatch correctly using URL). For the pass through with security case, client should sign wsa:headers (WS-Security requirement) and hence wsa:to cannot be changed by ESB (violation of signature); Hence, the requirement for "preserve addressing". When the response comes from WCF->ESB, ESB adds addressing header regardless of whether the original message (from WCF) has addressing or not. In above case, since wsa:headers of request is signed by client, response from WCF will contain a signed wsa headers. If ESB adds one more set of addressing headers, then it will be violating protocol. Hence the requirement for "disable addressing for out messages"
0. Set up the Active Directory as the KDC as in my previous blog post. 1. Download WSO2 ESB 3.0.1 from here unzip and apply the patches patch0003 and patch0023.These patches are not publicly available - but will be added in to the future releases. 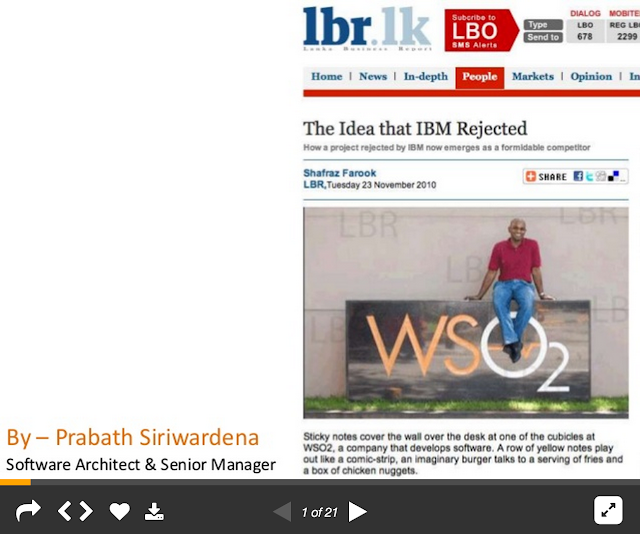 If you interested, please contact us on bizdev@wso2.com. 2. Create a file called krb.conf inside [ESB_HOME]\repository\conf and copy the following content to it. Here, WSO2.COM is my root domain name of my Active Directory, which is acting as the KDC and 192.168.2.1 is it's IP address - so you need to change them as per your setup. Make sure that you have default_realm all caps. 3. Create a file called jaas.conf inside [ESB_HOME]\repository\conf and copy the following content to it. 6. Select 'Sign & Encrypt with Anonymous' from the Security Policy wizard. 7. After applying, edit the policy and replace both bindings with the content below. You need to set your SPN password under service.principal.password and also the absolute path to krb.conf under java.security.krb5.conf. 8. You can write the Java client to this service as explained in my previous blog post. 1. Go through this previous post and get the WCF Service running properly with the Kerberos authentication. 2. Download the Kerberos java client Eclipse project from here - import it in to an Eclipse workspace and fix the missing references - all the jars available inside [WSO2_ESB_HOME]\repository\components\plugin. You can download WSO2 ESB 3.0.1 from here. 3. rampart-core, rampart-policy and wss4j should be picked from patch0003 and patch0023. These patches are not publicly available - but will be added in to the future releases. If you interested, please contact us on bizdev@wso2.com. 4.Make sure the Eclipse project compiles. You must have this Client section. 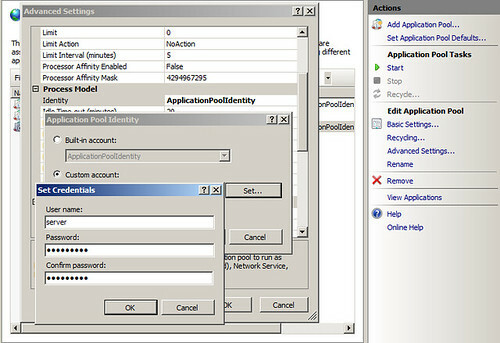 Here we set useTicketCache=false; so our java client need not to be running from the same Windows domain as the KDC. 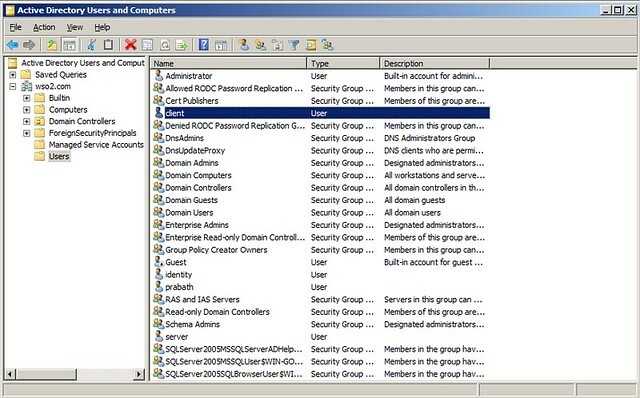 If you set to true, you need to be in the same Windows domain as the KDC and also edit the Windows registry at the client end - my previous blog post explains how to do that - see #6. This is the security policy of the client and we have to set the path to jaas.conf and the absolute path to the krb.conf - at the same time we need to set the username and password of the client who invokes this - and this account should be in the Active Directory. 2.2 Find the following setting in web.config unser EchoService project and change it appropriately.. Here service/myserver is the SPN you create before for the user server. 2.7 Open up the app.config file under EchoClient project and edit the following configuration appropriately..
That's it - now you can run the client from the IDE by setting it as the startup project. How to fetch HTTPS end point certificate chain via Shell ? Following is the easy way via shell.. The above will save the certificate chain corresponding to www.amazon.com in cert.pem file. Wrote a blog sometime back on "How to invoke a web service call with curl ?" in RampartFAQ.com - but that doesn't explain how to work with Curl with HTTPS. Today morning I got a question from one of my colleagues and thought of writing a blog on the $subject in detail..
Let's go with few examples..
*   SSL certificate verify ok. This HTTPS connection works fine, because, the client trusts the CA of the Amazon's SSL certificate. If you have a look at the above file, you will see all the trusted CAs listed there.. In the case of Amazon, it's Verisign who the CA is.. This succeeds.. since we asked Curl to ignore SSL validation issues..
You will see, above fails since server certification is not trusted. 6. Let's improve step-5 - by asking Curl to trust our CA certificate. The following video explains TCP/IP 3-way handshake - and later we are going to hand-craft the packets used in TCP/IP handshake with Scapy. Now lets open up another console in the client end and start Scapy again..
Now, first create an IP packet - you may notice the src is set to the client IP and the dst been set to the server IP. Then we need to send the crafted packet. With this we are expecting SYN ACK from the server. But, if you press Ctrl+C and then a.nsummary() on the other console we are running Scapy, you will see an RST been sent from the client after the SYN. Linux kernel automatically sets appropriate header values and knows how to complete a TCP 3 way handshake. Scapy does not use these kernel services. It creates a raw socket. In the previous case, as soon as the kernel sees the SYN/ACK it responded with a RST - because it did not send the SYN [it was through Scapy]. So, we need to avoid this behavior and this is how we do it. We can use iptables on our host to suppress outbound RSTs to the destination we are working with. Once the above done performs steps 1 to 3 and you won't see an RST been sent from the client. Now the client needs to send ACK for the server's SYN. Here you will see the sequence number is increased by one and the the sequence number from the SYN ACK form the server been set as the ack. This attack relies on a perpetrator sending a large amount of ICMP echo request (ping) traffic to IP broadcast addresses, all of which have a spoofed source IP address of the intended victim. If the routing device delivering traffic to those broadcast addresses delivers the IP broadcast to all hosts, most hosts on that IP network will take the ICMP echo request and reply to it with an echo reply, multiplying the traffic by the number of hosts responding. To simulate a Smurf attack we need to do the following..
On Mac this is how you do it..
2. Send a large amount of ICMP request to the broadcast address of the victim network(Directed Broadcast Address). 3. Source IP of the attacker must be spoofed. As per  when we send a ICMP request with a spoofed IP been set to the broadcast IP of the network, the server will broadcast the ICMP response to the entire network.. In the following example with Scapy, we are not using a broadcast IP - instead using an IP address of a different machine in the network. Then type the following - you can see the source IP been spoofed to the target machine IP. That's it - since we want to confirm the response from the server, 192.168.2.10 goes to 192.168.2.11 - I am also running scapy there too.. The above will trace ICMP traffic targeting 192.168.2.11 - after sometime press Ctrl+C and type the following on the target machine..
1. Configuring the individual hosts and routers not to respond to ping requests. 2. Configuring routers not to forward packets directed to broadcast addresses. I wouldn't have written this blog post, if everything went well for me while doing the $subject.. I was trying with MacPorts - it gave me the following error..
:error:configure db46 requires the Java for Mac OS X development headers. By going through some of the MacPorts tickets found out that we need to have Java for Mac OS X 10.6 Update 3 Developer Package installed first - which you can get from here. Once that is done, only following is needed.. I worked on adding Kerberos support for Apache Rampart and WSS4J during last few weeks and interop testing with WCF. Following lists some useful debugging tips I came across.. 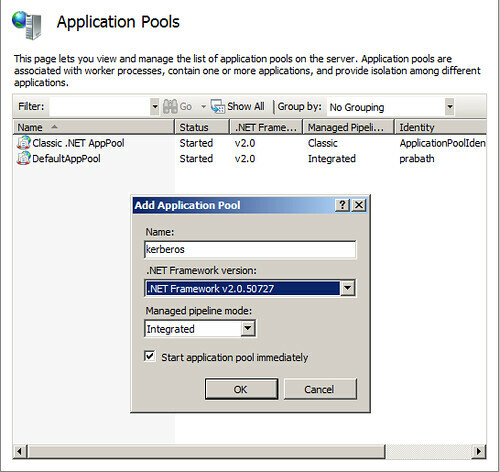 The Parameters subkey stores configuration options for the Kerberos V5 authentication protocol in Windows Server 2003/2008. By default, Windows does not allow the session key of a TGT to be accessed. Add the following registry key on the client side, so that the session key for TGT is accessible and Java can use it to acquire additional service tickets. -s Snarf snaplen bytes of data from each packet rather than the default of 64K bytes. Packets truncated because of a limited snapshot are indicated in the output with ``[|proto]'', where proto is the name of the protocol level at which the truncation has occurred. Note that taking larger snapshots both increases the amount of time it takes to process packets and, effectively, decreases the amount of packet buffering. This may cause pack- ets to be lost. You should limit snaplen to the smallest number that will capture the protocol information you're interested in. Setting snaplen to 0 means use the required length to catch whole packets. This is how you can download the entire repository and set it up locally.. The above will download the entire P2 repo to the local machine. All WSO2 products are based on WSO2 Carbon, which sits as the core for all of them. We do have a clear Front-End [FE], Back-End [BE] separation - where the FE web application talks to the BE, via web service calls. This benefits the end user - which adds the flexibility of developing his own client to the corresponding back end functionality in a language independent manner. All UI components you see in the default distribution talk to the BE services via SOAP over HTTPS. In case of digging in to an issue - since this is on HTTPS - it's hard to intercept the communication channel and figure what exact messages being passed from FE to BE. This is how you can do it - to intercept messages flowing over SSL. 2. The private key of WSO2 Carbon, in PEM format - you can download it from here. Make sure to have the correct interface set as per your system. [-i lo0] and start the ssldump before you start the server. Now you can track all the messages between FE and BE in clear text. We've been involved in many cases solving issues related to SSL. The latest one I came across was at a customer site, where WSO2 ESB wants to communicate with an SSL end point(WCF) hosted on IIS 7. The only thing here what we have to do is, importing the CA certificate of the WCF end point to the ESB's client-trustore.jks [which is under ESB_HOME\resources\security]. This worked well at the start - but in one machine it started to fail - with no clue at all..
Once you set this, it will print the entire SSL handshake. By going through the logs, we could figure out the issue - where by mistake in this particular machine, in IIS, for this end point - 'Require SSL' being set to Accept, instead of Ignore. What does that mean.. and why did that fail..? When we set the above parameter to Accept, the server validates the client certificate only if it's been sent in the request from the client. When you set these two, the client will automatically attach the client certificate to the SSL handshake - in our case it failed because we were not expecting mutual authentication, so IIS didn't trust ESB as a client. Another tool comes in handy while SSL debugging is openssl s_client. There was a case, where WSO2 ESB talking to an SSL end point behind an Apache server - in that case all the configuration options we provided didn't work - so the option left behind was to test the SSL setup of the Apache server in an independent manner - and proved us Apache server had issues in SSL setup. There we used openssl s_client. For example if you want to verify the SSL handshake with the end point, localhost:9443, you can use the following command. :\>openssl s_client -connect localhost:9443 -state -nbio 2>&1 | grep "^SSL"
The above will result in the following out put. Let's finish off the first part of the SSL debugging series with ssldump. ssldump is an SSL/TLS network protocol analyzer. It identifies TCP connections on the chosen network interface and attempts to interpret them as SSL/TLS traffic. When it identifies SSL/TLS traffic, it decodes the records and displays them in a textual form to stdout. The above prints following [only a part displayed], when I visit https://cloud.wso2.com. Almost all online services provide a way to recover your password, in case you forget it. Let's look at different ways this feature being implemented by major online service providers..
- But - you need to make sure you set strong secret questions for the first time - if you set weaker ones there your account can be compromised at any time - even you change it later..
- Make sure answers to your secret questions cannot be found via any of your social networking profiles..
- Then you can gain access to your account, but you will never be able to change the original secret questions, so if the attacker knows the original, he can comeback anytime and get the control of your account once again. 2. Start the Identity Server and go to https://localhost:9443/carbon - then go to Policies --> Entitlement and add a new XACML Policy - then replace the default one with the one below. The XACML policy below addresses following authorization requirements. 3. Download the .NET client from hear - unzip it - edit the app.config to point to correct EPRs where your Identity Server [XACML engine] is running. 4. You can parse the XML response returned from the XACMl engine to get the decision. This blog post is a follow up to the Guide to write XACML policies in WSO2 Identity Server - Part - 6. This post addresses following authorization requirements. This blog post is a follow up to the Guide to write XACML policies in WSO2 Identity Server - Part - 5.